Fr. Shanley, O.P. has served three terms as president of PC. In an email addressed to the Providence College community on March 29, President Fr. Brian J. Shanley, O.P., announced that he will not be returning to serve as college president following the conclusion of his current tenure on June 30, 2020. 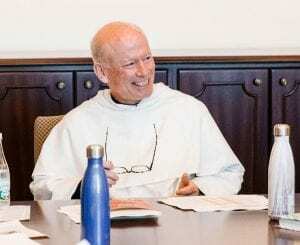 This decision came following a February Board of Trustees meeting in which the Board Affairs Committee recommended that Fr. Shanley be given a fourth consecutive five-year term as president of the College. However, Fr. Shanley’s Provincial, the Very Reverend Kenneth Letoile, O.P., decided against such a proposition this past Monday, informing Fr. Shanley that he would not be eligible to return as president following his current tenure. In response, the Board of Trustees issued its own statement on the matter, explaining that they were “deeply disappointed in this decision.” The Board stated Father Shanley’s time in office was transformational, with many new buildings being built on campus and the enjoyment of immense success in the College’s capital campaigns since he took the position in 2005. In addition, the Board made it known that they “had been counting” on Fr. Shanley’s fourth term to materialize so that PC may continue to see extraordinary advances in the world of higher education. The Board of Trustees was not alone in recognizing the impact that Fr. Shanley made on the College during his three terms of office. Fr. Peter Martyr Yungwirth, O.P., chaplain of PC, praised his fellow Dominican for his contributions to the College and student body at large. More information regarding the succession process is expected to be shared by the Board of Trustees in the coming weeks.